As the beauty brand's global ambassador, Rosie Huntington-Whiteley attended the bareMinerals new BarePro Longwear Lipstick celebration at the Jean Georges at the Waldorf Astoria in Beverly Hills, CA yesterday(January 16th). Rosie has that kinda style where she can pull off just about anything. 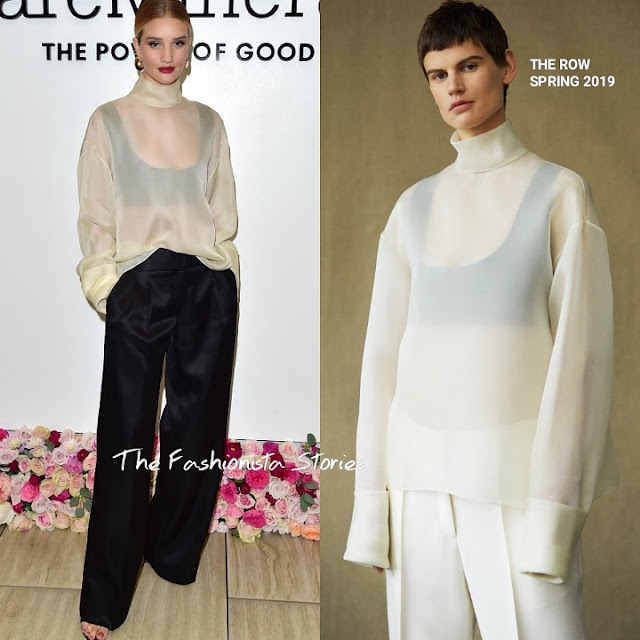 While her THE ROW SPRING 2019 ensemble is on the baggy side, she pulled it off effortlessly. Her hair was perfectly done in a sleek center part up-do, which complimented the high neckline of her sheer organza top. A pop of color came via her red pout which topped off her look along with VHERNIER jewlery and JIMMY CHOO sandals.